Hi everyone! Honestly I can’t believe 2018 is almost over, this year flew by in a whirlwind of crazy for us! But 2019 is quickly approaching, and so I thought I’d better release the 2019 Daily Planner! 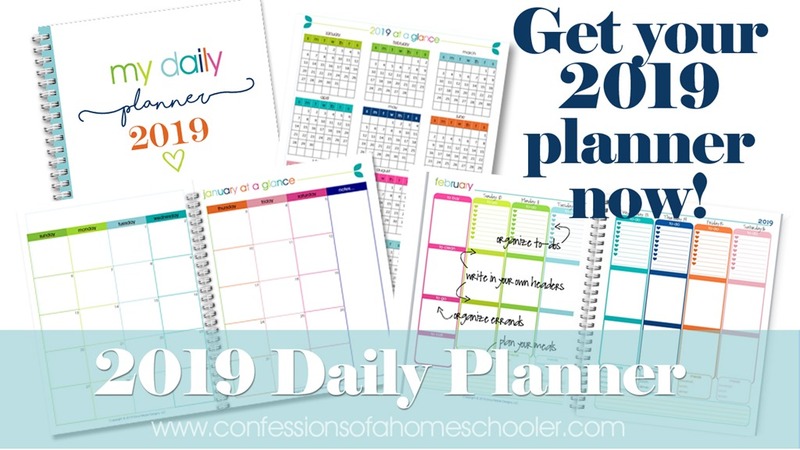 Even though I’m a homeschooler, I’m also a work-at-home mama, and then we have all of our personal commitments so I really wanted a planner that I could use for everything. 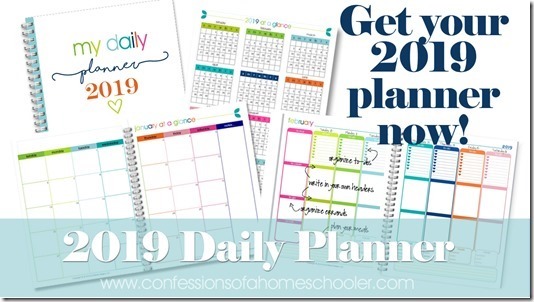 This annual daily planner runs from January 2019 – December 2019. In past years I’ve used a separate blog planner to keep track of work stuff, but I was also carrying around a planner for our daily activities, my iPhone to help remind me of things, and sticky notes to remind myself of things to pick up or to do. Obviously with a family of 6 that just isn’t working very well. So I created my own weekly planner that has spots for everything, so I can hopefully track it all in one place! I’ll show you how I intend to use the planner below, but I’ve left most of the spots blank so that you can customize it to fit your needs too. 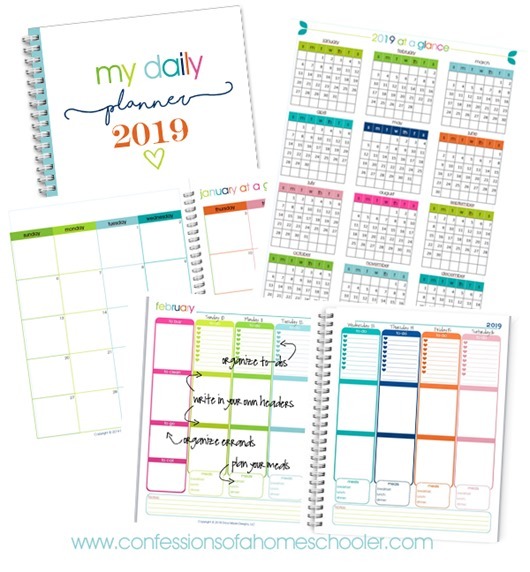 The planner comes with a 2019 yearly overview, along with a monthly overview spread, followed by weekly planning pages for each month. 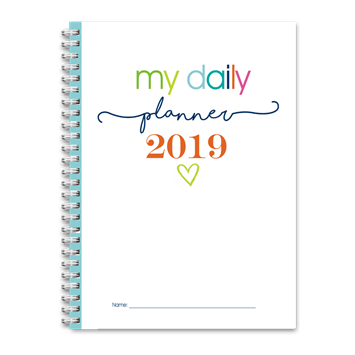 This planner runs from January 1, 2019 through December 31, 2019. This download has 156 pages or 78 pages if you print double sided. 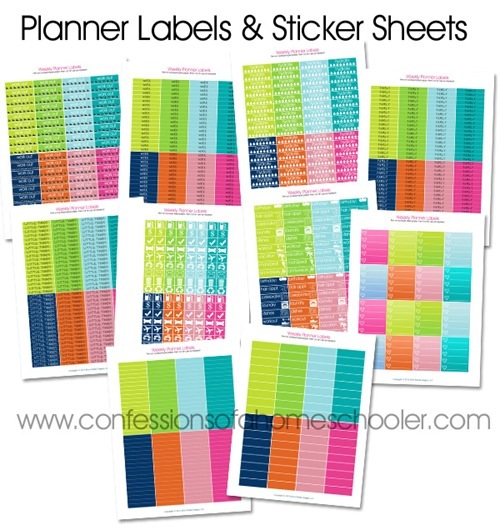 Printable sticker sheets to help label your planner! Extra Information: Social Media, Pinterest Ideas, Recipe Ideas, Websites, etc. Here’s a close-up of a weekly spread. The far left side has sections to write in things to purchase, a cleaning schedule, errands to run, and people to call for that week. There is a to-do list at the top of each day as well. Then I left the other headers blank so you can write in your own. You might choose to separate them out by category, for example family and work like I’m doing. Or you can use them more like time slots during the day like morning/afternoon/evening, or whatever works for your family. It’s totally up to you! 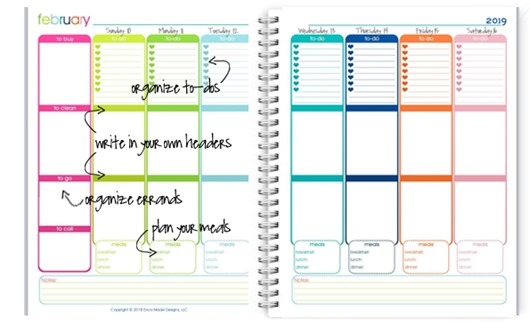 There’s also a small section for meal planning at the bottom of the planner as well where you can jot down ideas for the week to help with creating your shopping list. I’ve also included a notes section at the bottom of each page for extra notes if needed. Below is a sample of how I’ll be using the planner and filling in my information for the week. Please note that this is NOT a replacement for our homeschool lesson planner. There is simply too much information in my lesson plans, especially with four children, to be able to squeeze that into a regular planner. So for now that is kept separate. However I will add things I need to purchase for our homeschool week, or library books that need to get picked up, etc. on this planner so that I can get them while we’re out. After using my planner, I decided that I would like to have some pre-printed sticker labels for things that I knew I would be doing regularly! So I went ahead and added them in for you too! 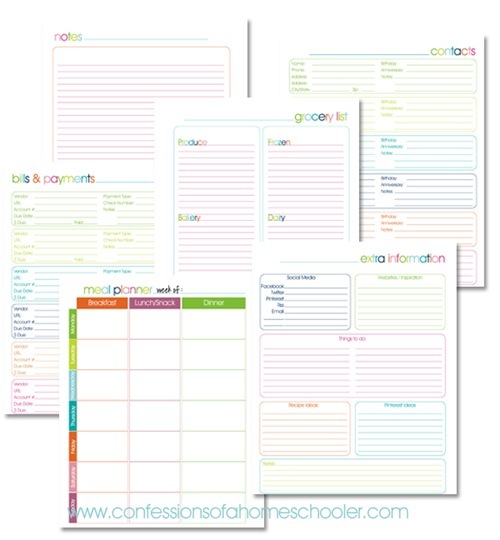 I also included blank sheets that you can customize as well. 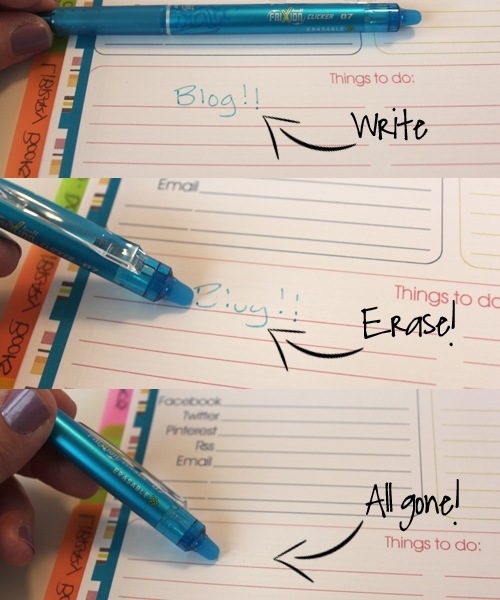 To use: Simply print the sticker sheets on full sheet label paper, then cut and use as desired in your planner! I print my planner pages double-sided on light weight cardstock or heavier weight paper so that the ink doesn’t bleed through. I also highly suggest getting your planner spiral bound at your local office supply store as well. It’s usually only a few dollars, but makes using your planner much easier! Of course you can always punch holes, and stick your pages in a 3-ring binder too! Whatever works best for your needs. If your printer has a double sided printing feature you can use that. If not you can print the ODD pages first, then flip your paper over and printed the EVEN sides so it comes out double sided. You may also wish to print extra of the sticker sheets and extra pages like notes, grocery lists, etc.. 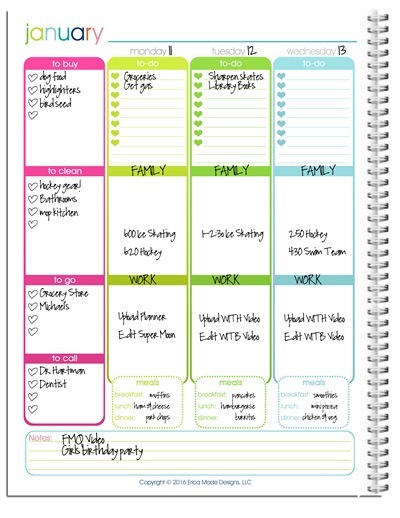 I hope this planner fits your needs, and makes keeping your life organized a little bit easier and more colorful! Please NOTE:This planner is a digital download product. You will NOT receive a printed planner via mail. Is the planner a download format or a physical item to be shipped?